I think people would be interested to see a bit different documentary from the mainstream, about the Isle of Man TT. 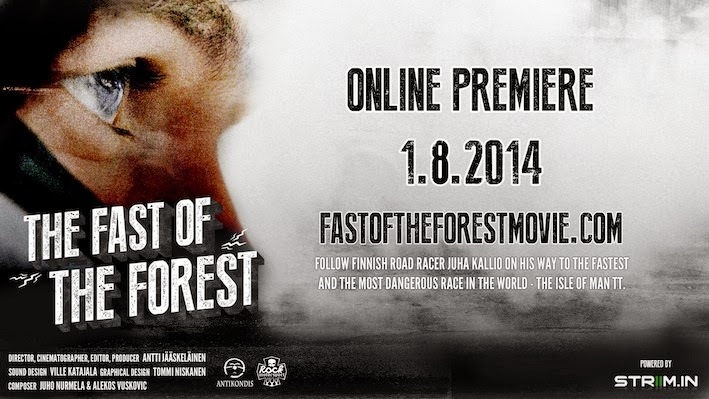 The documentary film about the Finnish road racer Juha Kallio, will be available online globally starting August 1st (today) at fastoftheforestmovie.com (there's a charge of €2.99). Currently we have subtitles in Finnish, English, French, German, Spanish, Italian and Hungarian. We are having a competition where anyone who watches the film within the first week, will be included in a competition where you can win an A2 size poster of the film with the main character's and the director's autographs, and a one of a kind Juha Kallio Club 171 jacket with Juha's autograph. If you think this would be worth mentioning on Sideburn, please feel free to do so, I would appreciate it greatly. I also attached a picture if you would wish to use that on the story.